Heat oven to 350°F. Cut dough crosswise into 4 pieces; place on ungreased 15x10-inch pan with sides. Press each piece into 5x4-inch oval; make indentations with handle of wooden spoon. Brush 1 tablespoon of the reserved mozzarella marinade on each oval. Lightly sprinkle with 1/4 teaspoon salt and 1/8 teaspoon pepper. Bake 18 to 22 minutes or until golden brown. Meanwhile, in 12-inch nonstick skillet, heat 2 tablespoons of the remaining mozzarella marinade. Sprinkle chicken breasts with 1/4 teaspoon salt and 1/8 teaspoon pepper. Cook chicken in marinade over medium-high heat 15 to 20 minutes, turning once, until chicken is no longer pink in center and thermometer inserted in center reads 165°F. Remove from skillet; cut diagonally into 1/2-inch slices. In each of 4 shallow bowls, place 1 focaccia. 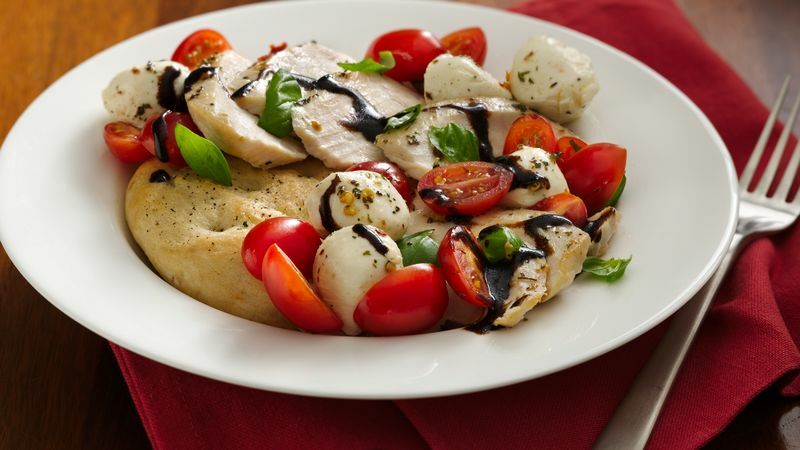 Top with chicken, tomatoes, mozzarella and basil. Drizzle each with olive oil and balsamic glaze. Sprinkle with salt and pepper; garnish with basil sprigs, if desired.